Susan Fletcher King is an artist with a professional background in illustration and graphic design. After leaving the design and advertising world behind in order to travel, train horses, milk cows and raise her family, she has returned to her art, this time with an emphasis on fiber. While some of her art is taken straight out of her observations of the physical world, others tend to grow from fragments of dreams and memories. Susan has an established reputation with several galleries in the United States and has exhibited at various quilt shows including the International Quilt Festival. She currently resides in Houston with her husband and son. 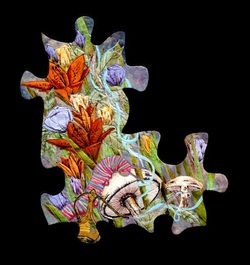 Caterpillar & hookah, part of the Alice In Wonderland puzzle.